See how SPJs organizational reporting structure would change under the new bylaws [PDF]. – Spring 2016: Board votes down proposal to move from 12 to 9 regions, renewing conversation about board composition and priorities. – June 2016: Executive Committee creates Governance Task Force. – Summer 2016: Task Force begins work. – EIJ16: Task Force presents its charge at membership meeting. – Fall/Winter 2016: Task Force collects member input during two online sessions and a Share Your Thoughts prompt on this page. – April 2017: Full board endorses Task Force recommendations. – EIJ17: EIJ17: Delegates pass bylaws to restructure board. Over the next two years, the Society of Professional Journalists will restructure how it is governed. With an 86-14 vote during the Excellence in Journalism 2017 conference, SPJ delegates passed bylaws changes to reduce the national board from 23 members to nine. The evolution will take two years. – Three officers, including a president, president-elect and secretary-treasurer, each to be elected for one year. – Four at-large directors, each to be elected for two years with staggered terms. – Two appointed directors, each to be selected by the board to serve one-year terms. – Draft and enact a strategic plan for three to five years, setting annual goals to ensure that work toward planned priorities remain on track. 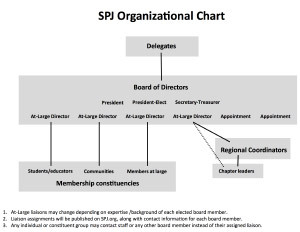 – Adopt a new organizational chart to ensure fruitful communication between board members and SPJs many constituencies, including chapters, communities and regional coordinators. Although regional directors will be removed from the national board, they will remain as a committee that continues to serve chapters and members in their area. The move will free them from the dual responsibilities of serving as a regional director and national board member. They will continue to be elected to two-year terms. Delegates declined to accept an amendment from the Press Club of Long Island that would have required a sitting regional director to be either an at-large or appointed board member. Some students, likewise, wanted a stronger guarantee that student voices be considered at the board level. (The bylaws that passed require a campus voice  either student or faculty  be among the at-large or appointed members.) Other members expressed concern that the board would not be diverse enough without a representational model. As part of its work, the Governance Task Force also drafted samples of policies to guide a smaller, more strategically focused board. The sample policies  subject to revision by current and/or future board members  include documents related to board positions, board appointments, the nominations process, and reimbursement for board expenses. – It will revisit a suggested organizational chart to make sure all SPJ constituencies have a board advocate. – It will create a diverse, representational Nominations Committee to cast a wide net for board candidates. – It will use its appointments to address any missing viewpoints, as well as to bring in experts to assist with immediate priorities. – It will welcome additional input and ideas from members on this page. All current board members will have the opportunity to fill out their elected term. However, all non-officers (including regional directors) have been given the opportunity to step off the national board. – Region 1, 4, 5, 7, 8 and 9 directors. Note: Two at-large seats will be elected (in addition to the officers). Two individuals will also be appointed. Board size will be nine. Why is the board endorsing plans to reduce its size from 23 to nine members? After much debate and deliberation, board members came to believe that a smaller board will be more nimble, better able to make decisions quickly. Whats the benefit of moving away from a large representative board  where members are selected because of where they live (current Regional Directors) or another SPJ identity (as a student, campus adviser, etc.)  to one focused more on strategic thinking? In using geography and special interest to find leaders, SPJ often ends up with whoever is willing to run. With 13 or more spots to fill each year, the Society struggles to find multiple candidates for each spot. The priority then becomes finding candidates who check a box rather than those who possess the best leadership skills. With geography and special interests removed, SPJ will have greatly improved ability to find the most qualified board leaders. If not tied to geography or special interest, how will SPJ find candidates for board positions? With future board support, the nominations process would change. At present, the immediate past president of the board often acts as a one-person Nominations Committee. Going forward, the Nominations Committee would include a wide range of SPJ voices, with a goal of identifying and recruiting a larger number of candidates with the vision and skills to serve as directors. In addition, members would still be quite welcome to nominate themselves or other members. How would the new board serve members better than the current representative one? With future board support, the new board would begin its life by crafting a three- to-five-year strategic plan to guide the Society. Board members crafting that plan would be a leaner group elected because of their ability to provide strategic thinking and guidance. They would then would revisit those goals every year to ensure that various SPJ constituencies  committees, communities, chapters, regions, staff, etc.  were completing the tasks to achieve stated goals. That does not happen at present, given the boards size and the priorities of its various members. What about diversity? How can a smaller board  that is not representative  meet diversity goals? Diversity will be a chief priority in the nominations process. Diverse membership on the Nominations Committee will be key. Additionally, the proposed bylaws call for two appointed board members each year. Under that system, the seven elected board members can address diversity concerns with its appointments. Additionally, the new boards strategic plan will likely address diversity goals of SPJ and its members. Lastly, it will be important to hear diversity of thought. Through the proposed organizational chart, every member of SPJ will have a direct pipeline to the board of directors. Why not include the immediate past-president on the board? An informal survey, of past eight to 10 immediate past presidents, showed a preference for leaving the board. Under a sample policy, past-presidents would then chair the new and expanded Nominations Committee. And they would be quite welcome to remain involved in other SPJ priorities, as many currently do. Why remove the 12 Regional Directors from the board? As noted above, the board no longer believes geographic representation best serves its membership. The regional structure of SPJ will remain intact, with no changes in the regional boundaries, the regional conferences or the Mark of Excellence competition. Under the new bylaws, Regional Directors would be renamed Regional Coordinators and serve most of the same functions. Who would make for good board appointees? As noted above, appointees could address any gaps in diversity. Chiefly, however, appointees can provide particular expertise the board needs to fulfill its strategic plan goals. One year, for example, the board may seek someone with fundraising experience. The next year, it might want someone with membership-building skills. What about students, who make up about a quarter of the SPJ members? How will this new approach to the board serve them? Under the new bylaws, the board would no longer have two designated student seats. But students would be quite welcome to run and continue to be encouraged to be involved in a myriad of other ways. Additionally, the bylaw changes call for the board to appoint a student member or a university faculty member if none is elected as an officer or at-large director. This change would ensure that a campus voice is always present at the board level. Who would make the best candidates for this new, smaller board? The new board will be most successful if comprised of members with vision, strategic thinking, the ability to work as a team, and the ability to delegate to staff and the SPJ committee/community/region/chapter/member structure. How will SPJ determine if board candidates possess such skills? The Nominations Committee will create an application and interview process, reviewing a suggested Position Profile  all subject to full board approval. Do all current SPJ board members support all of the proposed bylaws changes? No, but most of the members support most of the ideas. – At its April 2017 in-person meeting 22 of the 23 members voted in favor of the Governance Task Force recommendations that produced the bylaws proposal. But the board rejected, 15-7, a Task Force recommendation for term limits for at-large board positions. – During a June 2017 conference call meeting, the board voted unanimously to recommend that the delegates adopt the proposed bylaws. However, during that call, it voted 7-6 in favor of allowing non-SPJ members to serve in appointment board positions. A few current board members also oppose the idea of calling for the Nominations Committee to endorse board candidates. Who gets to vote on the proposed changes in bylaws? Only official delegates to the national convention can vote. Per existing bylaws, chapters are assigned delegates. Chapters are encouraged to fill their delegate positions and ensure that their delegates have reviewed the proposed bylaws change before EIJ17. Delegates, along with any other SPJ member, can also attend a general business meeting at the convention, which will largely focus on the bylaws proposal. That will be 8 a.m., Sept. 9, in the Orange County 2 room at the Anaheim Marriott. When will the delegates vote? Delegates will vote during the closing business session at EIJ17, scheduled for 2:30-4:30 p.m. on Sept. 9 in the Orange County 2 room. All members are welcome to attend the session. If the bylaws changes pass, what happens next? A yes vote will enact proposed Article 9A of the new bylaws and the official transition to the new board will begin. No current board member (including those elected during EIJ17) will be removed. Each person will be given the opportunity to fulfill his/her term. The transition will take place over two years. In addition, the Nominations Committee will be formed as soon as possible and the board will begin reviewing all policies to ensure they are applicable to a new board. If the bylaws changes fail, what will happen? Under a no vote, the board will remain the same size and be governed in the same way. Wish to share your thoughts? We'd love to hear them. Leave your comments about board governance issues here.